We’ve undergone a label redesign and have worked hard to make our labels more readable and giving you the information you are looking for at a glance. We have created nutri-dots describing our products for you. An important note about salted versus non salted products, if you don’t see the sodium free symbol, it has salt. We have changed the text style so that you can easily see the difference between creamy and crunchy. Organic products will have an organic lid and natural products will have a natural lid color coded for increased visibility. 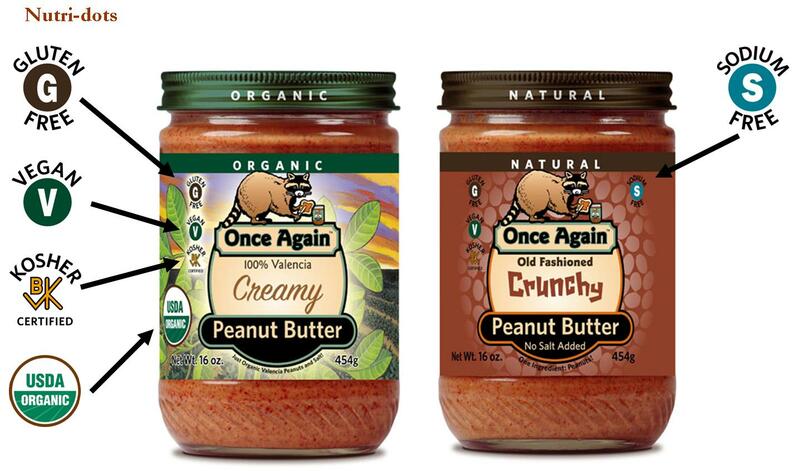 In addition, we have created a color band stating organic or natural on the top of all of our labels. Our lids have not been put into production yet, but will be in the up and coming months. Many of our new labels also contain recipes, the story about our raccoon logo and our economic development projects in Nicaragua. Hey Gail, I like the re-design..Glad you kept the cooner.Your compassion for animals and your company ethics run together.. as well as your excellence in healthy peanut butter. I will FB your 20% off offer for all my FB wildlife rehabbers to read. Baby season is almost here and I always encourage people to fuel their foster critters with healthy foods..yours in on the top of my list. DEC RVS-permitted Wildlife Rehabilitator, class II; primarily raccoons & skunks. DEC Nuisance Wildlife Control Operator; rescue and live removal with compassion.